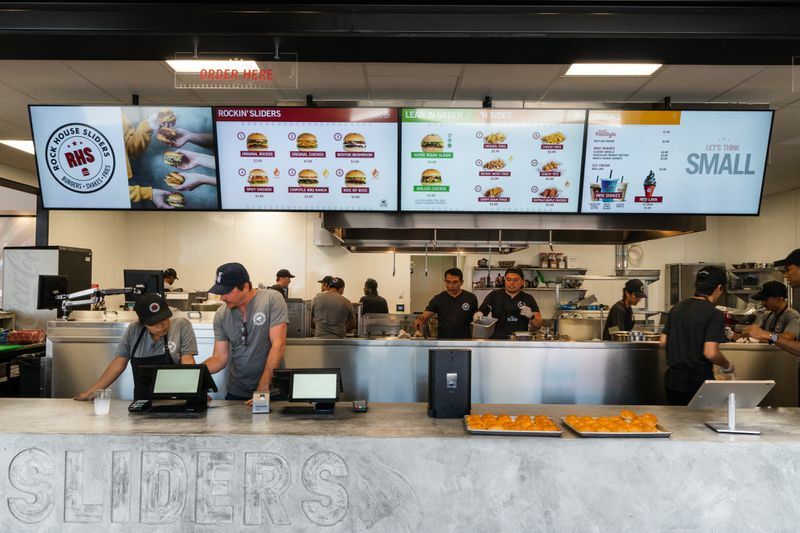 Rock House Sliders, an international fast-casual restaurant, will open its first Los Angeles location on Thursday, July 12. The brainchild of three friends in search of a good burger in their home country of Kuwait, the new West Hollywood eatery hopes to bring high-quality ingredients to signature sliders that come in Angus beef and chicken varieties. Located right on Sunset Boulevard in the long vacant Luca on Sunset space near Crescent Heights, the new restaurant should be a boon for the neighborhood, especially given its address in a major residential complex with limited dining options beyond neighboring restaurants EVO Kitchen and Flavor of India. The menu boasts eight sliders, six sides, beverages that include mini shakes, and charcoal-activated black ice cream for dessert. The small, two ounce patties come topped with things like house-made sauce, cheddar cheese, pickles, relish, shredded lettuce, shaved onion, and tomato on the Original Rocker, and spicy sauce, pepper jack cheese, pickles, and frizzled onions on the spicy chicken. Sliders are priced at $3.89 each, and sides range from $2.49 to $3.89 for the messy fries. This won’t be the only LA location of the slider spot, with the team hoping to continue their expansion to Downtown and Santa Monica later this year. Rock House Sliders West Hollywood will open Sunday to Thursday from 11 a.m. to 11 p.m. and Friday and Saturday from 11 a.m. to midnight. “An International Slider Chain Slings Mini Burgers This Thursday in West Hollywood.” Eater LA – All. https://la.eater.com/2018/7/11/17555756/rock-house-sliders-west-hollywood-open.